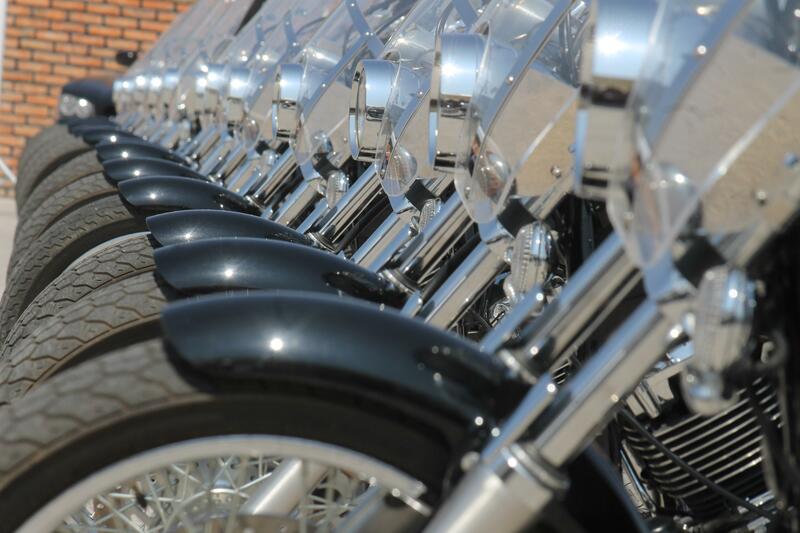 Ocean Lakes Family Campground welcomes all bikers! However, we have some specific park policies to insure the safety and camping enjoyment of all. Please note that motorcycles can not be driven in the campground under power to your site. Guests are permitted to trailer or tow their motorcycle to their site, but are not permitted to start the engine. Some guests prefer to park their motorcycle in the motorcycle area in overflow parking. All 3-wheeled vehicles (Can-Am Spyder, Polaris Sling-Shot, etc.) will be handled like motorcycles and will not be permitted to ride into the park. These 3 wheel vehicles will have to park at the south gate lot and an orange wrist band will be issued (no car pass needed). For large motorcycle events such as the Harley-Davidson Spring Rally (the second weekend in May), Ocean Lakes arranges for motorcycle parking at the South Gate entrance (photo above). Every year this event has grown. Ocean Lakes continues to become more popular with bikers because we work hard to accommodate them and our non-biker guests at the same time. We have received many positive compliments from both. Even the bikers say its nice to travel back into the campground where it is quiet and relaxing, away from the large roar of motorcycles. They enjoy being able to sleep. Non-biker guests compliment us as well and say they actually enjoy going to the South Gate to see all the bikes lined up. More than 900 bikes were parked at the South Gate Area, and hundreds more were kept at people’s campsites. We open the “South Gate” for the spring and fall events. The hours are set annually, for the fall event they were: gate open 7 AM – 11 PM (Thursday, Friday, and Saturday – 8 AM to Midnight, and then the last day, Sunday, 8 AM to 4 PM). We will be accommodating all Ocean Lakes camping and Annual Lease Site guests and will be utilizing our existing “short term” parking program ($5/ day). The Storage, Main Office and Security teams will add the necessary staffing to provide a smooth and consistent trailer parking procedure during this time frame. We cannot provide the constant 24hr “in and out”/”parking motorcycles inside the actual parked trailer” service, but we will store all Ocean Lakes guest trailers as needed and in accordance with our current “short term” parking procedures. 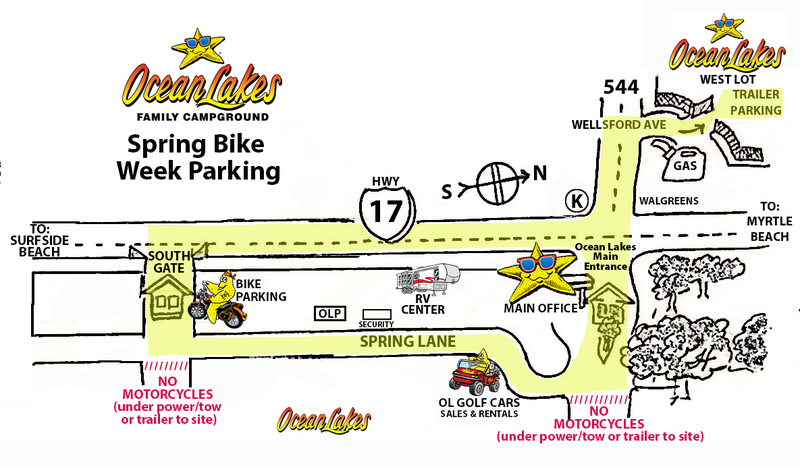 The Ocean Lakes guest will be required to park their motorcycle at our designated parking area (shown above, see map), located within the South Gate overflow parking area. The unloading of the motorcycle can be accomplished at the South Gate motorcycle parking area or within the camper storage lot west drop zone (see map). The unloading of the motorcycle can be accomplished at the south gate motorcycle parking area or within the camper storage lot west drop zone. The unloading of motorcycles at the site is not recommended unless the guest has a tow dolly. Riding motorcycles past the designated area and to the site, coasting motorcycles (not under power but guest sitting on the seat) are NOT permitted. Rope and dolly towing is permitted to and from the site. YOU MUST BE A REGISTERED OCEAN LAKES GUEST TO PARK IN OUR LOTS! The golf car is a great mode of transportation, helps conserve space for more bikes at the South Gate, and is great for towing bikes from Ocean Lakes guests’ sites to the South Gate exit of the campground. During this event, large lights are installed for safety and a Security teammate mans the Ocean Lakes South Gate property around the clock. Guests on motorcycles arrive and depart via the South Gate. * All dates are subject to change by event organizers.